Sixteen-year old Craig (played by Keir Gilchrist “Hungry Hills” 2009) feels like his world is crumbling down around him and he just might lose it. Craig resides in Brooklyn and attends an exclusive school for gifted students although he is convinced there was a mistake in the admission, as he doesn’t believe he has what it takes. The stress of not living up to his father’s standards academically, coupled with the terrible teenage pressures we all remember, are causing Craig to contemplate suicide. After a terrifying nightmare where he kills himself, Craig heads to the nearby hospital and surprisingly has to prove to the doctors that he indeed needs help. Finally, a doctor he sees believes him and Craig is admitted into a psychiatric ward for at least five days of observation. We soon find out what just five days can do to change one person and everyone around them. Once admitted (a.k.a. once it is too late), Craig understands that the youth ward is under renovation and he will be staying in the adult ward. He receives a tour of the adult ward from his mentor and after meeting a slew of “crazies” throughout the halls they finally reach his room. He walks in to find his soon-to-be roommate (“a middle aged Egyptian dude” to Craig) wrapped up in blankets on his bed. He scans his roommate’s surrounding area to find the following: holes in his shoes, an old winter hat on his dresser and a wonderful array of fungi on his feet. Needless to say, Craig immediately has second thoughts and tries to leave, telling the doctors he is fine and that he has so much he needs to take care of for school that he just can’t afford to miss five days. This obviously doesn’t fly. Soon, Craig befriends a fellow patient named Bobby, (Zach Galifianakis “Due Date” 2010). Bobby tries to include Craig in activities and introduces him to others in the ward. One day, during a group meeting, Bobby admits that he has an interview for a group home the next day but doesn’t have a shirt to wear for it. Craig offers that his mom could bring over a shirt from their house nearby and another patient takes note of this kind gesture. In fact, this patient, Noelle (Emma Roberts, “Valentines Day” 2010), is the same one Craig has had his eye on since being admitted. Unbeknownst to Craig, he has just hit two birds with one stone. In the next few days, we learn that Bobby would be homeless if it wasn’t for this pysch ward and that the mother of his young daughter should probably either join him in the ward or even replace him, as she is completely insane. After learning of Bobby’s hardships, Craig begins to see why Bobby pushes people away at times and focuses on helping him see that people do really care about him. Meanwhile, his adult psych ward crush is also crushing on him. Obviously, the girl he’s been “in love with all his life” back at home just broke up with her boyfriend (also Craig’s best friend, go figure) and she decides to visit Craig in the hospital at the most inconvenient time. Galifianakis’ true acting talent is revealed in this film as he is not the typical “funny guy” we are used to seeing in most of his roles like, “The Hangover” (2009). 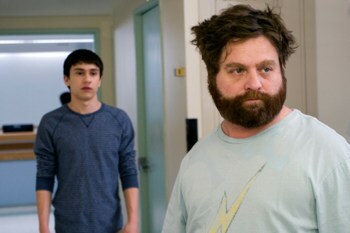 Although he does have his witty moments, Galifianakis’ performance is heartfelt and believable. He plays the perfect, “I’m a tough guy” on the outside but anxious, lonely and depressed on the inside. In one of the more comical scenes, Bobby and Craig are playing basketball and they stop to try and practice Craig asking Noelle out. The Galifianakis we know and love shows his comical side here as he “impersonates” Noelle, responding to Craig’s numerous failed attempts at asking her out. “It’s Kind of a Funny Story” is based on the 2006 novel of the same name by Ned Vizzini. Directors Anna Boden and Ryan Fleck, who both recently directed “Sugar” (2008), do a wonderful job capturing the emotion in this film. I don’t want to spoil too much for you, but what I can say is that the simple messages are what stand out in this film. Craig figures out what makes him happy, while making those around him happy at the same time. He can finally look forward to the things he wants to do in his future and for the first time in a long time, he appreciates the small things in life. This sounds so simple yet I feel like many people still struggle with these issues today. This movie especially hit home when Craig reminisced about his childhood, remembering the times when everything was so carefree; then, suddenly, life changes, surrounding him with pressures that suffocate him. Bottom Line? Galifianakis proves himself as an actor here and Gilchrist and Roberts will surely be going places. It is a feel good movie despite the subject matter.